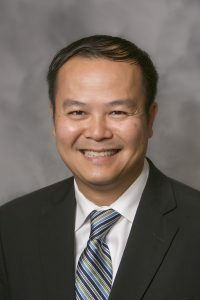 Dr. Phu Truong has been recognized as an author in a medical abstract that was one of the chosen, out of over 5,700 submitted, to be presented at the American Society of Clinical Oncology (ASCO) Annual Meeting that will take place in June, 2017. The ASCO Annual Meeting highlights cutting-edge research in cancer care treatments at a condensed two-day program. The purpose of a medical abstract is to provide a useful summary of a longer medical article or study. This selected abstract was based on a randomized phase II study of ipilimumab, a monoclonal antibody that works to activate the immune system. The Cancer Center of Kansas is so proud to have a team of physicians dedicated to ongoing research in the field of oncology; thus, bringing the latest treatment options and information to our patient’s. For a link to view Meeting abstracts click: http://abstracts.asco.org/199/IndexView_199.html.